This is my favorite Mexican restaurant in Madrid and I’ll tell you why. Mestizo is in Barrio de Salamanca. If you walk through the Puerta de Alcalá or Recoletos, it’s a very good choice for lunch or dinner. They have the most representative dishes of the Mexican cuisine. For starters, I always ask for the flutes (crispy and with delicious cheese), and they also have a mixed dish with “Antojitos” that include tamalitos and chiles, among others. As a main dish, I recommend (and you’ll find out why I’m right!) 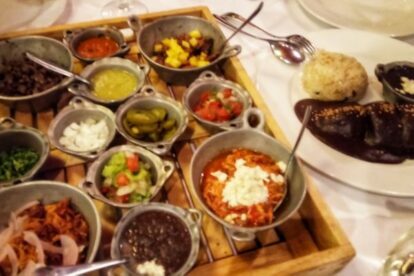 the tapas, an appetizing tray with fillings like black beans, cochinita pibill, chicken with mole, guacamole, onion, pico de gallo. You won’t be able to stop eating. When it comes to drinks, they have the best margaritas in Madrid without a doubt. They have two versions: on the rocks and frozen. You can ask for tamarind in the latter, which is perfect if you like sweet and sour. I recommend booking, but there are fewer people on evenings in the beginning of the week. Another delicious thing is that on Sundays they have the perfect brunch for recharging your batteries after a busy weekend. Marta and Marivi are the hosts of the restaurant and are very friendly. You can ask them anything about each dish and how hot you would like it.